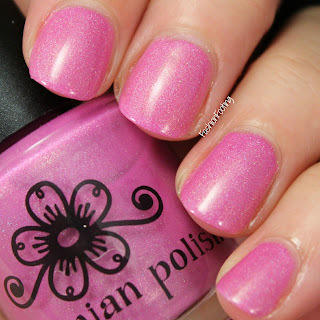 Today I have 3 polishes that I received in a giveaway prize from Pinwheel Polish! These are my first Pinwheel Polishes so I was excited to try!! This is the Autumn Trio. Hot Toddy is a off white milky jelly with orange, brown and gold glitters. These are super sheer so if you don't want to see your nail, I would layer over an opaque base color. This was 4 coats of Hot Toddy, plus topcoat. Flannels By The Fire is a gray jelly with metallic orange, green, and blue glitters. This was 4 coats plus topcoat. NightFall is a black jelly base with rainbow micro glitter. 4 Coats, plus topcoat. Even though these were really sheer, they were not thick or goopy at 4 coats, and the glitters were plentiful but not chunky. I like the color combinations and they are perfect for layering over opaque base colors! Have you tried Pinwheel Polish?? Since it is fall time, vampy is a word that appears often in regard to clothing, makeup, and nails. I am not the most vampy of polish wearers but I felt this was a great time to bust out an old old OLD favorite. When I was younger (meaning teenage years), Maybelline Vintage Burgundy was. My. JAM. I wore this polish all the time and I still have it so it seemed appropriate to wear it for the Vampy prompt. Well, that was my plan, but since I hadn't used Vintage Burgundy in years, it was beyond saving. I tried adding thinner and shaking and shaking and shaking and it was just beyond repair. So that's sad but I had to pick another polish, lol. I went with OPI's Malaga Wine, which I recently purchased from Meijer on clearance. This is a beautiful deep berry color. It's somewhat sheer and needed 3 coats for opacity. Shown with topcoat. 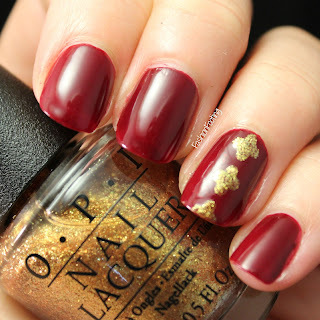 I wanted to add some drama to the nails and used a nail vinyl and OPI's Goldeneye. Whatchu think?? What is your favorite vampy polish to wear?? Are you so excited??? I have the Harvest Festival collection from Nine Zero Lacquer, aka Jessface90 of the YouTube. These are all holos and pretty fabulous, so let's get to the pictures. Because I don't feel like typing the same thing 8 times, ALL of these polishes had really fantastic formula's and were opaque in two coats. I also used topcoat for all of these pictures. S'more Holo is a taupe holo. This holo is more subtle than some of the other polishes in this collection but such a beautiful color! Corn Maize is mustard yellow holorgraphic color. I love this color, it's not something I have a lot of and it was so nice to have an easy formula for a yellow polish. Pumpkin Everything is exactly that: a pumpkin orange holo. Candy Apple is a pinky red holo. Concord is a grape purple holo. September Sky is a dark blue holo. Cypress is pine green holo. Cricket is a black holo. This was the least holo of the bunch, but still pretty and easy to apply. I have two polishes from a new to me indie brand, Dashing Housewife Polish. I purchased two colors from her store a while back and here they are. I'm slow, lol. Not Just A Filler is a mint creme with green shimmer. This was 2 coats plus topcoat. The formula on this was a little bit thick but not unmanageable. 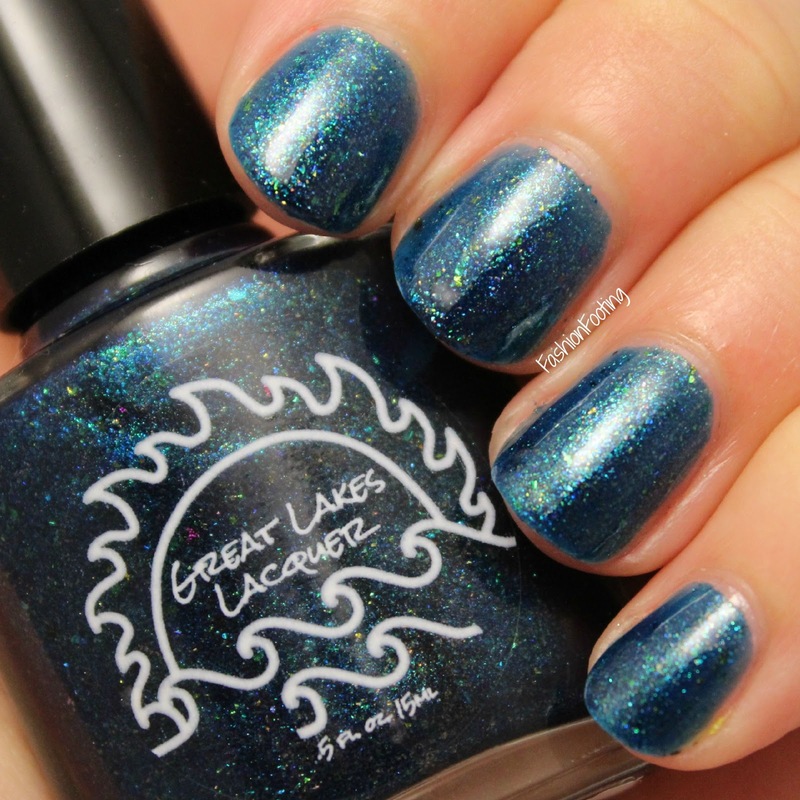 Holy Ships Ahoy is a medium blue with green shimmer. This was also 2 coats plus topcoat. This polish was the opposite of Not Just A Filler and was a little thin, lol. But it was not difficult to work with and still covered in two coats. Are you familiar with Dashing Housewife? 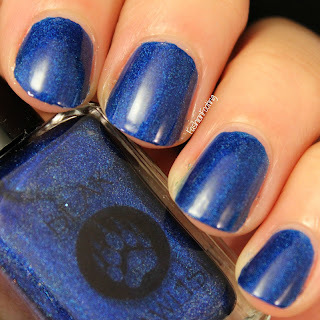 I picked up one of the polishes from the Runway Fall 2015 Sally Hansen collection, Boho Blue. Immediately, I thought this might be a dupe for the OG Pacific Blue and upon comparison, they are very very close. The formula on this polish is nowhere near as nice as Pacific Blue and Boho Blue required 3 coats, as it is a thick jelly consistency. However, if you are in love with the color of PB and don't own it, this is basically the same color, but in a jelly finish. If you didn't want to read all of that (LOL), this was 3 coats, plus topcoat. This is indeed a thick jelly polish, which could be tricky to work with if you are not careful. It did not level very well. Did you spot any of the Runway polishes or are you on the lookout for this collection?? I had to think about what other hobbies I have other than nail polish. I enjoy makeup and organizing but I was feeling lazy and didn't want to take the time to think about translating either of those to my nails, lol. Alaina suggested Netflix, since we watch shows together on Netflix and since I don't have cable, 9 out of 10 shows that I might watch are either on Netflix or Hulu. I chose Netflix! I'm very curious to see what my other Twinsie's hobbies are so be sure to read their posts as well! 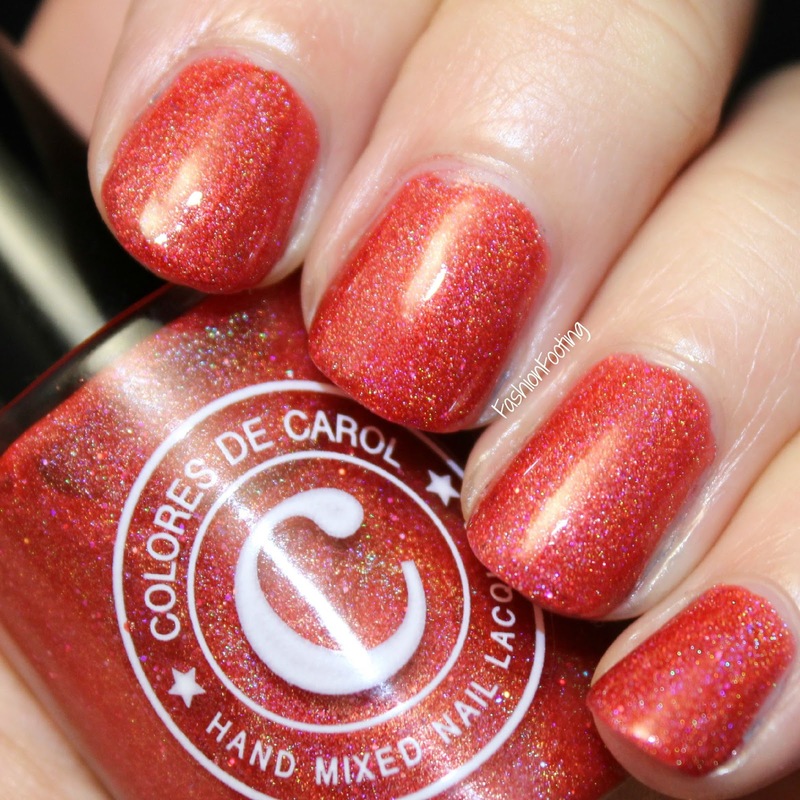 Colores de Carol Fire Coral is her limited edition polish for the month of September. It's a beautiful pinky coral linear holograph polish. It had a really great formula and was opaque in 2 coats, plus topcoat. 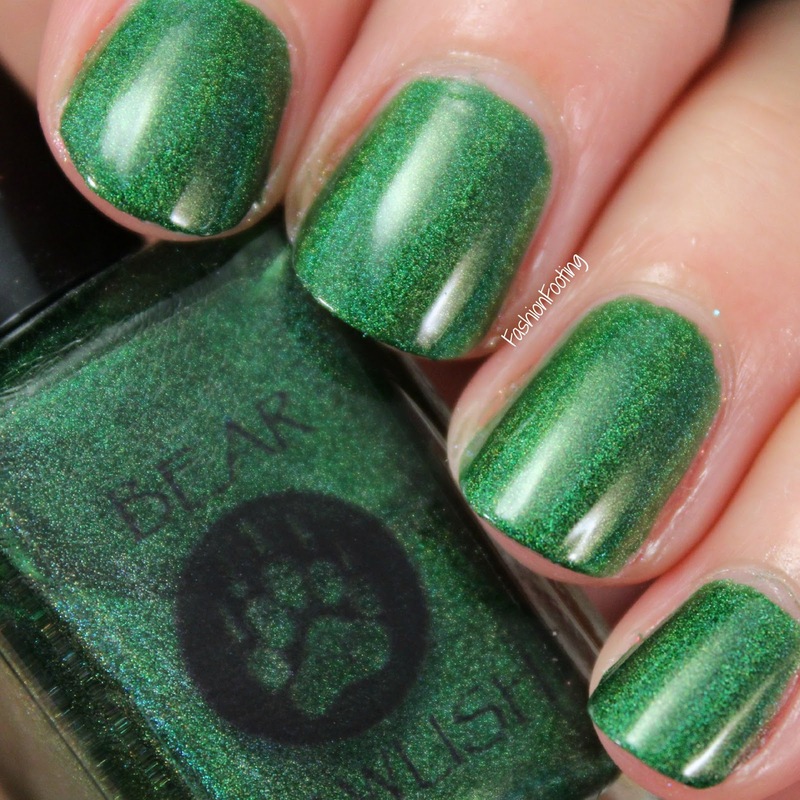 This is a beautiful polish and is only available through September so be sure to buy it straight away if you love it! 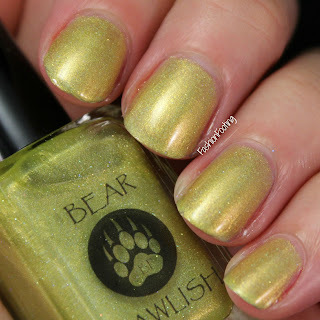 This is my first experience with Bear Pawlish! I was excited to try these so let's get to the photos! Lemony Snicket is a pale yellow gold scattered holograph. This was a little sheer but built up to opacity in three coats, plus topcoat. Ginja Ninja is (a fantastic name) a medium orange holograph. This was also a bit sheer and needed three coats, plus topcoat. Envious is a fabulous emerald green linear holograph. This is again a bit thin so it needed 3 coats, plus topcoat. Isn't That Special is a deep green jelly with blue and green assorted glitters. 3 coats plus topcoat. Master Thespian is a royal blue holograph. Again, a little sheer and needed 3 coats plus topcoat. Clever Boy is a bright blue linear holograph. This polish was the only polish that was opaque in 2 coats, plus topcoat. There was a bit of staining with this, so be sure to double up on base coat! Obviously the blue and green are my favorites! 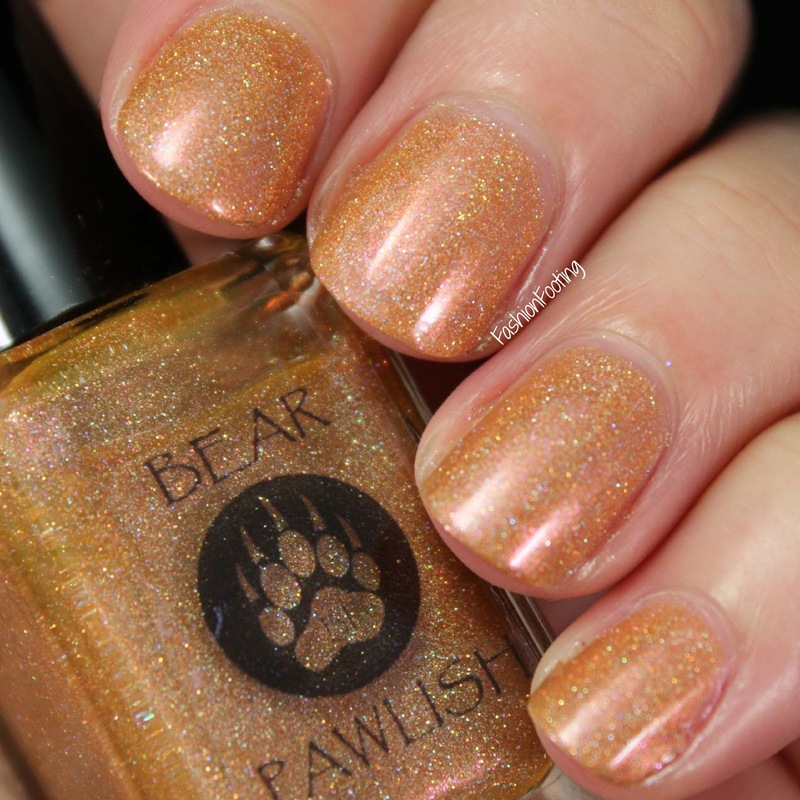 Have you used any Bear Pawlishes before? I don't know when they will be having a restock on any of these or any other polishes, but check their Facebook page for info! 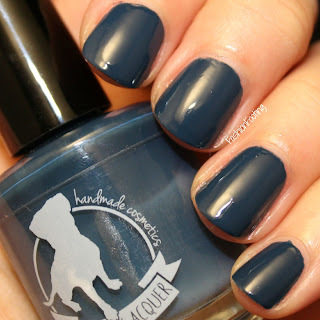 I have 6 Aliquid Lacquer polishes to share with you today! Vestalia is a white crelly with red, copper, bronze and gold flakes. This had a nice formula and was opaque in 3 coats, plus topcoat. Don't Stand So Close To Me is a brick red creme. I really like this color, it looks very rich. This was 2 coats, plus topcoat. Cry Me A River is a dark blue dusty creme. Again, really nice formula and 2 coats plus topcoat. Magpies At Midnight is a gorrrgeous dark purple jelly with blue and silver holographic microglitter. I used 3 coats and topcoat and I lurrve this! Aileen is black jelly with pink and silver holographic microglitter. This was 3 coats and topcoat. Lemuria is a dark blue linear holographic with blue holo microglitter and green flakies. This was 2 coats plus topcoat. I have quite a few Aliquid Lacquers and I really love all of the ones I own. The colors are unique and the formula's are really nice and easy to work with! If you haven't tried any of Alison's polishes yet, I highly recommend them! Today we are doing mani's inspired by our BFF and my BFF requested purple and hearts so here it is. 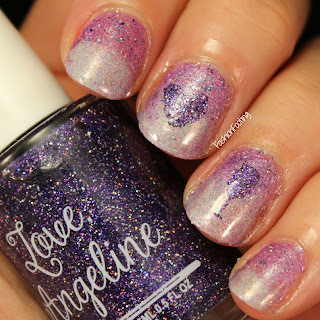 I used Love, Angeline Mystery Holo #2 and Love Letters, a Love Angeline Facebook group custom, for a gradient. After that dried for a bit, I applied a nail decal that I had made with Tanzanite Staccato using some nail vinyls. A heart because she requested it and a wine glass because what's more fun than sharing a drink with a friend? The polishes are so sparkly that it is a bit distracting to see everything, lol. TOO SPARKLY?! No, just very sparkly! 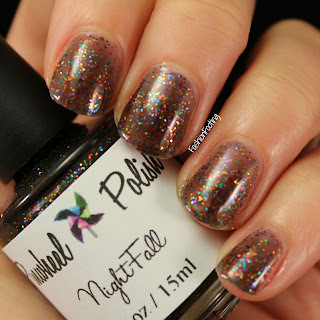 I have 3 of the Fall 2015 Wet n Wild Megalast polishes to show you today! This collection is made of 6 polishes but I only purchased 3. These Megalast polishes are consistently pretty fantastic. They have a wide brush, which I tend to like and the formula's are almost perfect! They are such a great find from the drugstore at $1.99! Stop and Mel-The-Roses is a dark red. This was 2 coats plus topcoat. I Moss Have It is a mossy green shimmer. 2 coats, plus topcoat. 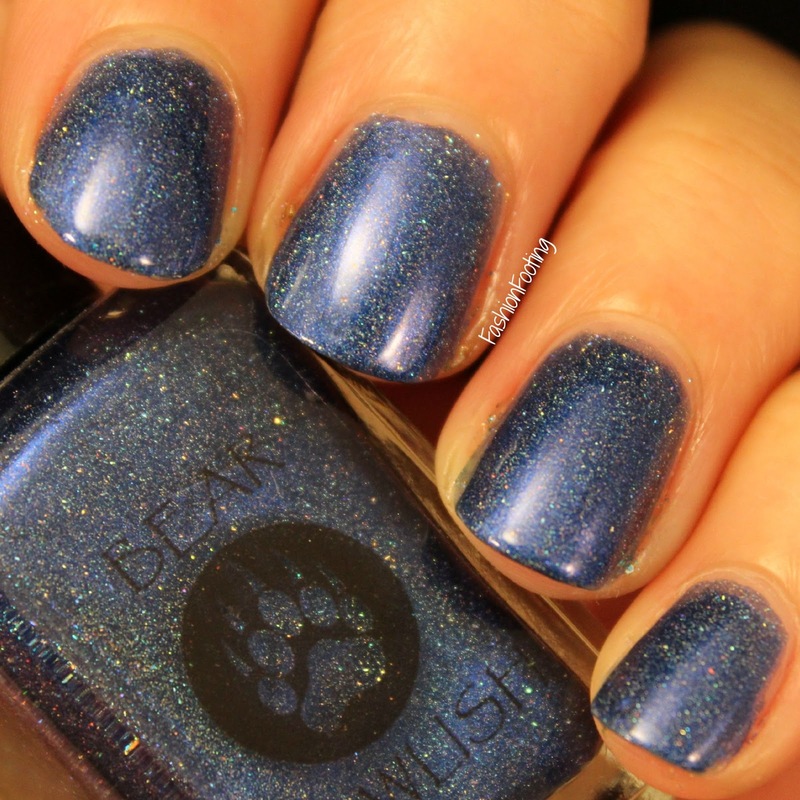 Pop Up Bluetique is a bright cobalt blue shimmer. You should all know how I feel about these types of colors by now :) 2 coats, plus topcoat. Again, these all had perfect formula's and were very very close to being opaque in one coat. I highly recommend checking out any of the Megalast polishes, core or limited edition! Today I have 3 polishes and a top coat and cuticle oil from the Moste Potent Potions collection from Bohemian Polish (formerly Finger Lickin' Lacquer)! This collection is inspired by Harry Potter, so you Potter lovers (is that what you are called? I'm sorry, I don't know!) will enjoy this post! Liquid Luck is a warm golden orange holographic. This is a scattered holographic polish and I really love this color. It was a bit sheer, so it needed 3 coats for opacity. I also used the Bohemian Polish Flash Dry top coat for this and all of the swatches. Love Potion No. 9 3/4 is a bubblegum pink scattered holograph with iridescent flakies. This was also 3 coats plus topcoat. Don't Mind The Steam is a magenta scattered holographic polish with golden shimmer. Again, 3 coats plus topcoat. 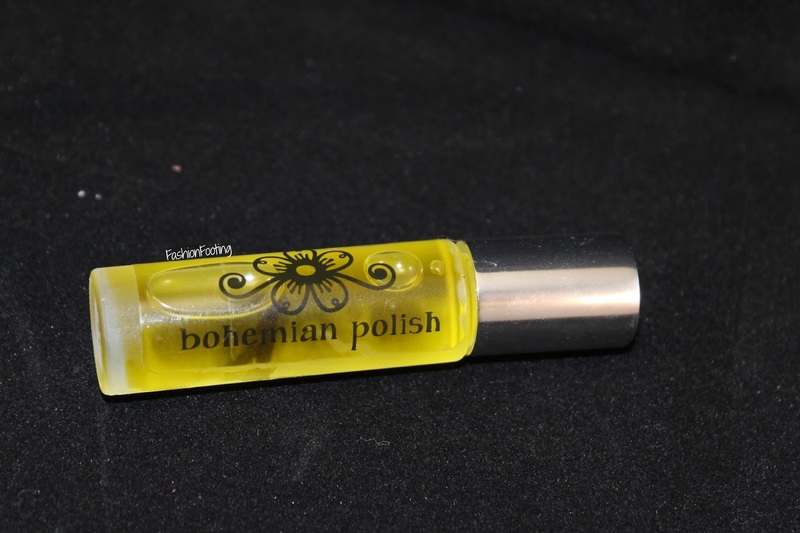 The Butter Beer cuticle oil comes in a rollerball applicator and smells heavenly: it smells like buttered popcorn!! If you are unaware, buttered popcorn jelly beans are my absolute favorite and this smells spot on. The cuticle oil smells nice and applies nicely from the rollerball. The Flash Dry topcoat is a nice thick topcoat, perfect for glitters! Jennifer was kind enough to include a discount code for use on the purchase of any of the polishes from this collection, using the code WANDCORE for 20% off! Round 16: Bestie Twin Nails with The Little Canvas! It's time for another Bestie Twin Nails with my buddy Alain from The Little Canvas. You know the drill: let's get to the good stuff. Alaina mentioned something about how it was Childhood Cancer Awareness month and that gold was the color for awareness. She then found this picture on Pinterest and we both said "YES" immediately when the time came for selecting our manicure. I then had the brilliant idea to make some of our BTN's focus on charity/cause awareness because who doesn't love crying?! I'm only kidding about crying (sort of), but I thought it was a nice idea to do manicures that focus on awareness and if it helps to bring awareness to some people even a little, that is an accomplishment. The first organization that pops into my head when I hear "childhood cancer" is St. Jude Children's Research hospital. I know there are many many many hospitals and organizations devoted to helping children with cancer but St. Jude is always the one I think of the most. I am so very blessed to have not personally dealt with such a situation such as childhood cancer and cannot imagine the stress, coupled with the crippling medical costs. St. Jude provides cutting edge medical options and care while freeing parents from the burden of the cost of these treatments. Did you know that 75% of St. Jude's budgeted costs are covered by public donations? I didn't realize until just at this moment of drafting this post that they relied so heavily on public contributions. I'm giving you this information as a PSA to seek out an organization that you care about and donate! I don't have a lot of money to donate but even $10 is better than nothing. This sounds preachy and it is not intended to be but I know that a lot of people think if they can't donate hundreds and thousands of dollars, that it's not worth it to donate at all and that is not the case. Every little bit adds up! Okay, longest post ever! Now onto the nails!! I used Orly Highlight, Gumdrop and Bling, along with some KBShimmer Chevron Nail Guides. To start, I painted all of my nails except my middle finger with Orly's Highlight and let that dry. I painted 3 coats of Orly Bling on my middle finger and applied two coats of top coat. Once my other fingers were dry, I used Gumdrop and Highlight on a makeup sponge to apply a gradient to my pinky and index fingers, and applied the chevron nail shields to my ring finger and then blobbed on two quick coats of Bling. Topcoat all the nails and boom. Done. I really love this manicure and I'm not sure if it's because the colors are so light but this gradient is one of the most perfect gradients I've ever done! LOVE! Today I have the Great Lakes Lacquer The Friends Collection, Pt 1. Part 2 will be releasing later this month and I've seen some teaser pictures on Instagram and it looks just as beautiful as part 1! The Friends collection is based on friends that we all have in our lives, not the TV show. Admittedly, I was a little bummed to not have a Friends tv show theme but once I realized what the collection represented, I totally understood the theme! Let's get to the polish, eh? The Triathlon Trainer is a "deep blue leaning teal jelly jam packed with aqua, green, and gold shimmer with highlights of multichrome, color shifting flake." This was opaque in 2 coats, plus topcoat. The Soul Sister is "a pinkish red with a vibrant violet sheen and a bit of holographic goodness". This was 2 coats, plus topcoat. Krazzzzie Fast Fingered Gamer Girl is vivid turquoise that leans a bit green in the sun and more blue with indirect light, with three types of purple shimmer. This is soooo much prettier in person, this photo does not even do it justice. I used 2 coats, plus topcoat. The Fashion Artist is a gorgeous medium blurple (blue purple) with aqua shimmer. This should not be a surprise that I love this color. These types of blues are always my favorite and I will tire of them! This was also 2 coats, plus topcoat. The Quick-Witted Comedian is "a light to medium teal green with loads of silver and green shimmer, purple/blue flake, and a slight touch of holographic pigment". Again, this was 2 coats, plus topcoat. I am so thoroughly impressed with Mariah's polishes for her first collection and being a new brand. The formula's are all really nice and easy to apply and I love the colors and the inspiration behind them. 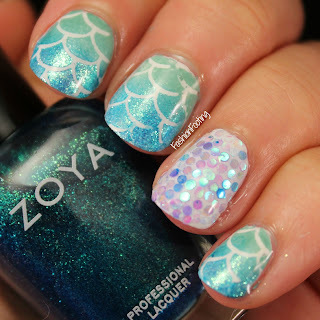 This week we are doing nails inspired by the ocean so a quick Pinterest search brought me to these nails that Kirby from The Mercurial Magpie did about 2 years ago. Kirby is an artist and freehand drew her mermaid scales but I cheated and used nail vinyls. I started with a white base and then did a gradient of Zoya Wednesday and Charla using some mermaid scale nail vinyls. The kicker is these circle glitters: I placed them one by one on my ring finger. It took forever, lol. I kinda of really loved these nails! 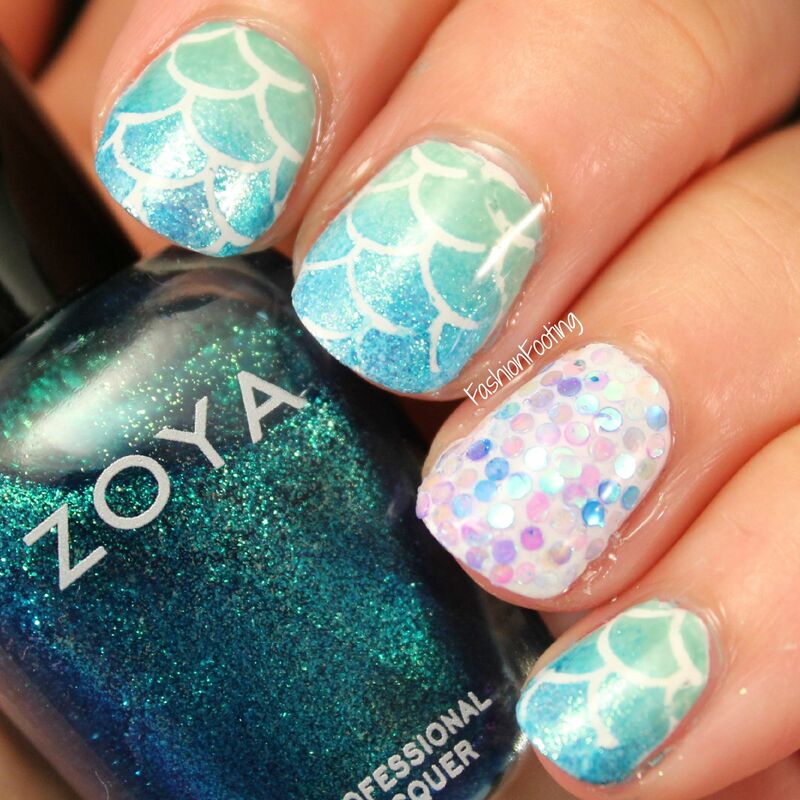 Be sure to check out the rest of the twinsies to see their ocean inspired manicures!